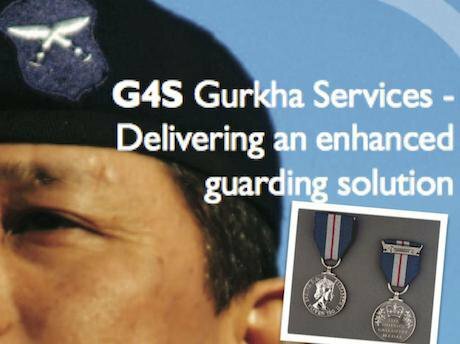 Detail from G4S Gurkha Services marketing brochure and Queen’s Gallantry Medal, as highlighted by Clare Sambrook. Yesterday, an American man was convicted for killing unarmed civilians whilst on patrol in Iraq. But he wasn’t a member of the US Army. When the incident took place, he was working for the company Blackwater. Last month, the Taliban carried out a lethal suicide attack in Kabul, Afghanistan. But the compound they targeted wasn’t controlled by the army of any nation. It was run by G4S. According to the Islamist group, the British company constituted an ‘important base of occupying forces’, from which attacks against the Taliban were planned and mobilised. What we do know is that many of these mercenary companies, especially ones based in the UK and US, were heavily involved in military campaigns in both Iraq and Afghanistan. We know their armed personnel can earn as much as £10,000 a month, tax-free. And we know that some private military contractors have been directly implicated in civilian deaths; the employees of Blackwater, now Academi, a US private military corporation, opened fire on Iraqi civilians in September 2007, killing 17 and wounding a further 20. In 2007, employees of Aegis Defence Services, based in London and run by the former Scots Guards officer Lt-Col Tim Spicer, posted footage on the web showing their guards firing their weapons at what has been reported as ‘civilians’. The company said the shootings were legal within rules of protocol established by the now-defunct Coalition Provisional Authority in Iraq. The company has also been criticised for allegedly employing former child soldiers from Sierra Leone as mercenaries in Iraq, for the simple reason that they were cheaper than their European counterparts. James Ellery, a former director, said the company had a cost-reduction ‘duty’ to recruit from cheaper countries. There is no central database of private military and security companies operating from the UK, and no legal requirement to register with a governing body. Only one dataset offers insight: the UK’s Company House provides a code for companies that offer security services. Thousands of small business are listed, offering anything from bouncers to industrial site protection. But within this list, our researchers identified 235 UK-registered military and security companies whose websites offered higher-level security work, usually international and involving armed protection. While the majority listed their managing director or founder, only one-fifth provide details of other staff. In general (77% of the time), staff members were either not listed at all, or referenced just using their first names or initials. A company such as Cobra International Security simply lists its staff as ‘Paul G’, ’John S’ or ’Chris M’, followed by descriptions of their professional backgrounds. Blurred pictures are often used, such as on the websites of Patriot Group and Excellentia. We asked these companies why they blurred their workers' faces. They declined to answer. None of this is illegal, but it does frustrate research into a controversial industry. At least 32 companies turned out to be using such ‘virtual offices’, allowing companies, for a fee, to use a ‘prestigious’ address (i.e. a City of London postcode) without actually operating from there. One of the service providers, Capital Office Ltd, used by at least six military and security companies, promotes its services by saying virtual addresses ‘can add to the authenticity of your new company because it looks like you have offices within a busy business hub’. Where these companies are actually operating is, again, opaque. More than two-thirds looked at either failed to mention where they operated or did so in obtuse terms, boasting a ‘global’ or ‘international’ reach. Sometimes they offered their services in ‘hostile environments’, ‘where the client needs us’. At best, they mentioned specific regions, seas or ports. But only 60 companies explicitly mention some of the countries they have been operating in, so overall operational transparency remains limited. The pervasive lack of transparency and vague phrasing also means it is impossible to determine what the companies are actually capable of. Often, they claim professionalism without providing specific examples, while descriptions of their work often provide no substance. One company said it provided ‘operational support services’ without specifying the type of support. Another company provided ‘project support by combining local knowledge with our own expertise in… complex environments.’ The most frequent phrase on the more than two hundred websites that Action On Armed Violence scrutinised was ‘bespoke security solutions’: vague enough not to break any laws. The websites are written in this strange language that combines military terminology with business-speak. These companies provide discreet services for clients that often want to remain anonymous. This is an industry run by men trained in concealment, secrecy and measured violence – and one that remains impenetrable to anyone who does not show funds to gain access. Industry insiders argue that they need to operate ‘under the radar’ to protect their clients, and not “share (them) with every terrorist, hacker or bad guy on the planet” as one security operative put it. This should not be an excuse to hide from transparency. In recent years, alongside counter-terrorism operations, anti-piracy campaigns have become a major source of income. This is reflected in marketing materials. Numerous companies explicitly mention working in either the Gulf of Aden, Indian Ocean, Gulf of Guinea, Horn of Africa or Somalia, and directly advertise their anti-piracy capabilities. The anti-piracy industry grew despite warnings that increased private military presence at sea displaces the piracy threat and tends to provoke pirates to use increased violence. British companies claim to operate in 17 out the 30 countries that the Foreign Office lists as ‘Human Rights Priorities Countries’ (namely: Iraq, Afghanistan, Libya, Somalia, Egypt, Saudi Arabia, Pakistan, the DRC, Russia, Colombia, Yemen, Syrian, Myanmar, Iran, Bahrain, Venezuela and South Sudan). What are these companies doing there? What oversight is in place in these operations, especially as in some places the government is itself implicated in gross human rights abuses? And who is paying these companies? We don’t know. We do, however, know that the UK government has, in last decade, deployed British security companies to at least five of these countries; Iraq, Afghanistan, Yemen, Libya and Somalia. And we know that civilians have been killed by security companies in some of these countries. Given the lack of accountability and media coverage in these areas we do not know just how many civilians have been killed, and what British companies – if any – were involved. Despite the security companies’ aversion to transparency, and evidence that some have engaged in human rights abuses and political destabilisation, the Foreign Office continues to deploy contractors to states where the Foreign Office itself has spoken out against human rights violations. The close ties between the military and the private sector translates into a physical presence. At least nine private military companies are located in Hereford, near the headquarter of the Special Air Service (SAS). The employment of former military personnel is, by many, perceived as an automatic guarantee for good conduct and the former soldiers, who are now pursuing a more lucrative career in the private industry, are seen as ‘heroes’ in the eyes of many. The impression of guaranteed professionalism that comes with the hiring of ex-servicemen can lead to a lack of scrutiny in the employment process. In 2009 a former British Army paratrooper shot two G4S colleagues in Iraq. The former soldier had been deployed by G4S, one of the world’s biggest security companies, despite being discharged from the British army and diagnosed with post traumatic stress disorder. G4S later admitted “systemic failures in vetting process”. Something similar also happened in 2016, when G4S had to explain why they had falsely claimed one of their contractors had passed the mandatory screening to carry a gun. The contractor, Omar Mateen, later carried out the worst mass shootings in recent American history when he killed 49 people at a nightclub in Florida. Combat Stress, the veterans’ mental health charity, has reported over 2,200 referrals for trauma-related mental health in one year. A paper surveying both serving personnel (regular and reserve) and veterans found that the weighted prevalence of common mental health disorders was 27.2%. The risk of suicide in men aged 24 and younger who have left the armed forces is about two to three times higher than the risk for the same age group in the general and serving populations. Such veterans can’t be guaranteed mental health support in the private military and security industry. While the appearance might be of a ‘continuation’ of armed service, the reality is different. The issue of working within the law stalked this inquiry. Internationally, there has been one attempt to monitor private military and security companies’ levels of compliance with international standards. The International Code of Conduct (ICoC), set up in 2010 under an initiative by the Swiss government. Yet out of the 235 companies, only 15 are members of the ICoC. Only seven percent have a ‘compliance’ section on their websites (out of the 212 functioning sites). More than 90% fail to mention compliance or standards. The language used by the companies who do mention compliance measurements is often vague. Some say they ‘aim’ to operate within the law, or that they will comply ‘where possible’. In many cases, it seems as if the clients’ needs are the singular priority. For example, one company claims on a banner on its website that ‘we don’t blink when you want to be secure and safe.’ This is far from illegal, but it does raise the question: how much are human rights considered in that blink of an eye. Some commentators have claimed that the UK’s private security market has radically reformed itself in recent years, away from the ‘fast and loose’ trading environment of the early days of the War on Terror. They claim that the International Code of Conduct for Private Security Service Providers that some companies sign up to provides standards that are kept. But this code of conduct remains voluntary and, despite the protestations of the industry being well-run, our investigation suggests strongly otherwise. The Security in Complex Environments Group, an organisation set up to develop standards for British security companies working abroad, is led by director, Brigadier Paul Gibson – former director of counter-terrorism and UK operations. In 2016, he told the Guardian Newspaper that ‘You’re always going to have rogue companies in any business sector. If a client is prepared to take a risk by using a private security company that is not regulated, that is a matter for the client. That is absolutely not the way British private security companies are currently operating.’ After looking closely at the industry, we’d beg to differ. Our research has raised special concerns about the British state’s inclination to outsource government tasks to private contractors, a support that has been indispensable for the private security industry’s growth and profits. Outsourcing military forces does not just undermine states’ claimed monopoly on the legal use of force, but given the lack of scrutiny of private military and security companies, private contractors may enable governments to get tasks done that avoid the scrutiny that comes with national force deployment. Even though the foreign office argues that UK-employed private military and security companies are just conducting defensive operations, and hence not qualified as ‘mercenaries’, the lack of transparency that pervades the industry offers little in the way of assurances or reasons to trust this statement. Until Britain’s mercenary industry shows greater transparency and oversight, Action On Armed Violence calls on the British government to take its declared human rights ambitions seriously. It must stop deploying private military and security companies to countries that have major human rights concerns.